W.D. County’s The Scent of Distant Worlds—a science fiction thriller that chronicles the adventures of a starship crew as it explores a planet 12-1/2 light years from home—is both innovative and wildly entertaining. Cassiopeia “Cassie” Clearwater is a Native American science officer on board the Far Traveler—Earth’s first starship—whose mission is exploration, with the “expectation of discovering wealth,” if possible. When the ship lands on a dark planet (“black and featureless as charcoal”) they nickname Obsidian, the crew unearth billions of dollars’ worth of diamonds. But their elation is short lived when Clearwater discovers that strange plants that cover areas of the planet are sentient — and Clearwater and her lover, pilot Jonas Jefferson, quickly realize that the Captain Maxwell Kazakov doesn’t care about the Prime Directive as much as he cares about becoming wealthy beyond his wildest dreams. He decides to essentially exterminate the plants so that mining can continue in the future… but he has no idea what the native creatures are capable of. The hook here is how County intertwines the human narrative with the point of view of the indigenous plants. The creatures, who communicate largely through smells, are just as intelligent and advanced as humans. The story of Pepper, a heroic plant who tries to stop the two sides from destroying one another, is arguably just as compelling as Cassie’s. When the two narratives are woven together, it creates an emotionally intense and page-turning read. 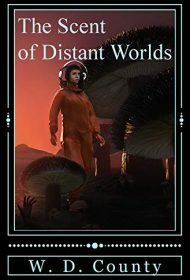 Tonally comparable to thought-provoking science fiction releases of the ‘60s and ‘70s—specifically Harry Harrison’s Deathworld trilogy and Ursula K. Le Guin’s The Word for World is Forest—The Scent of Distant Worlds is pure, unadulterated adventure science fiction. Breakneck paced, action packed, and character driven, this story is powered by an indefatigable sense of wonder and jaw-dropping plot twists that keep readers on the edge of their seats until the very end.